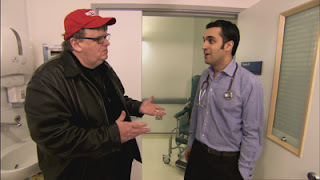 Love him or hate him, in Fahrenheit 9/11 documentarian Michael Moore’s investigation and indictment of the healthcare industry, he manages to tackle a topic that affects every American regardless of party lines and produces his strongest work since the film that launched him, Roger and Me. The film chronicles the creation and promotion of HMOs by former President Richard Nixon in 1971 as a profitable business venture that left patients reeling up through the admirable goal of former First Lady Hillary Clinton in trying to champion universal healthcare reform in the 90s that ultimately failed due to red-tape and big business trappings. When addressing the subject, Moore is at his best when focusing on the lives of everyday Americans who’ve become victims of the very healthcare system that should theoretically and morally help them. And in the opening minutes, we meet a few individuals forced to evaluate treatment options verses price tags and make choices on how much their bodily well-being is worth with decisions that should rattle even the most cynical Moore detractors. To this end, I defy audiences not to be affected by the heartbreaking stories of a woman employed by a hospital who, despite her position, must watch her beloved husband and father to her child die and the elderly couple who, both stricken with medical maladies in a short period of time are forced to move in with their grown daughter. Incidentally, the daughter’s husband is forced to leave America for work as a plumber in Iraq as he’s unable to provide for his family and their tearful goodbye occurs on the very day that her parents move in and are shouted at by their own son, who as viewers who’ve experienced medical situations realize, are often ostracized for weaknesses that is maddeningly out of their control. After revealing that fifty million Americans are currently without health care, Moore studies the problems plaguing both the citizens who aren’t covered by HMOs and those of us who are that are drowning in co-pays, pre-authorization headaches, preexisting conditions disqualifications, and claim denials that have caused some of our citizens to leave their beloved American home out of sheer financial necessity to seek help in places such as England, France and Canada. Explaining the policies of other countries, Moore shares that they not only have universal healthcare but incidentally also boast longer life expectancy and lower infant mortality rates than the United States. In the most controversial segment of Sicko, we meet three of our cherished American heroes who were part of the clean-up and remains search and rescue at ground zero on 9/11. Individuals from all areas comprise the group including some of whom are on disability and can’t make ends meet, denied additional support from the government since they weren't paid New York employees but people who came in from neighboring states or from other agencies just volunteering out of the goodness of their hearts. Unable to get the help they need here, Moore takes the three along with a number of other Americans who aren’t enjoying quality healthcare to-- as he hopes--Guantanamo Bay, Cuba where terrorists and prisoners are given exceptional medical care that most of us couldn’t begin to afford here in the states under HMO policies. Ultimately ending up at the mercy of the Cuban healthcare system, they are given no special treatment but receive comparable and at times life-enhancing tests and medication evaluations that enable them to-- as a few note-- feel better than they had in a long time. Eventually asking, “Who are we?” Moore makes us wonder at who we have become in our country with so many good-hearted people who sincerely want to help one another but are denied the basic human right of medical treatment. It shouldn’t be this way and Moore’s film couldn’t be timelier with the upcoming presidential election and proposed plans by some candidates who long to create universal healthcare platforms. And seemingly the only thing that would stand in their way is the HMOs and lobbyists but one thing is for certain and that is that such a plan would benefit all Americans regardless of which party, if any, that they belong to or follow. A film that every voter or parent should see-- Sicko may in fact be the movie that changes the toughest of attitudes when it comes to the man who risks judgment and his own safety to bring us stories mainstream media ignores right before they go to a commercial break with a channel block owned by makers of prescription medication.